This is quite a rough and overgrown track, the path visibility varies from invisible to tough bush-bashing. You should ideally attempt the East Peak of Deux Mamelles and leaving this peak for later on. The name of the mountain, Le Chat et la Souris, translates to 'The cat and the mouse', due to the appearance of the rocky summit when viewed from the south, resembling a cat looking down onto a small mouse. This mountain is not particularly high, with views very similar to its taller neighbour Bambous mountain, but is less streneous to reach the summit though the round trip route described here is a little lengthy. This is an overall enjoyable hike with no technical difficulties, though those wishing to climb to the top of the cat's head might find the space available a little small. Finally, in mid 2016, the disputes ended which meant that the hiking track to the mountain was opened up to the public. The hiking track is managed, with a parking area opposite the entrance, and there is a gate at the start of the track which is open from 07:00 to 16:00. This hike is popular and it is likely that there will be quite a few hikers undertaking this route. The path is mostly well signposted and clear, so using the GPS track isn't required to find your way to the summit. There are two parts to the hike, the first part starts from the entrance and follows a well maintained forestry track to reach a plateau with a viewpoint, and from here, the typical mountain climbing path starts to the small summit where the steel cross is located. Strictly speaking, this isn't the uppermost summit of the mountain, as to reach the summit, mountain climbing equipment will be needed to cross a cleft. Nonetheless, this is an interesting hike which should be on your list of 'to-do' mountains. As of September 2016, the part of the trail from the plateau to the cross is officially closed due to the ropes placed on the rocky ascent being 'under maintenance', but this should not be an impediment to reaching the summit by the cross, as the ropes are not necessary for either the ascent or the descent, and you will find plenty of people ignoring the warnings to continue to the summit. There is also conflicting information about whether hikers are allowed to continue to the cross without the use of guides. It would be wise to inform yourself beforehand in case you are challenged "aggressively". Note, the mountain trail from the viewpoint to the cross has been helpfully described as: "In the Alps this could be rated as climbing grade between I and II on the international UIAA rock climbing scale." 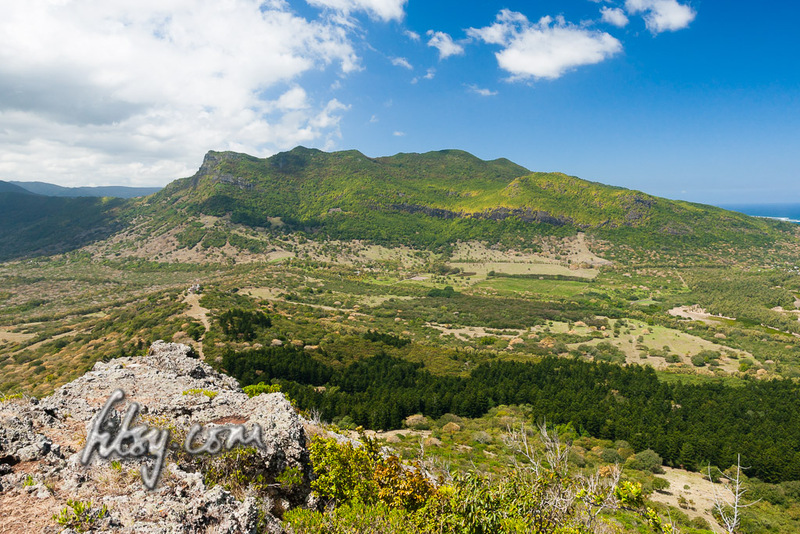 La Porte mountain and Piton du Fouge are two peaks on the Southern end of the mountain range to the West of Chamarel. 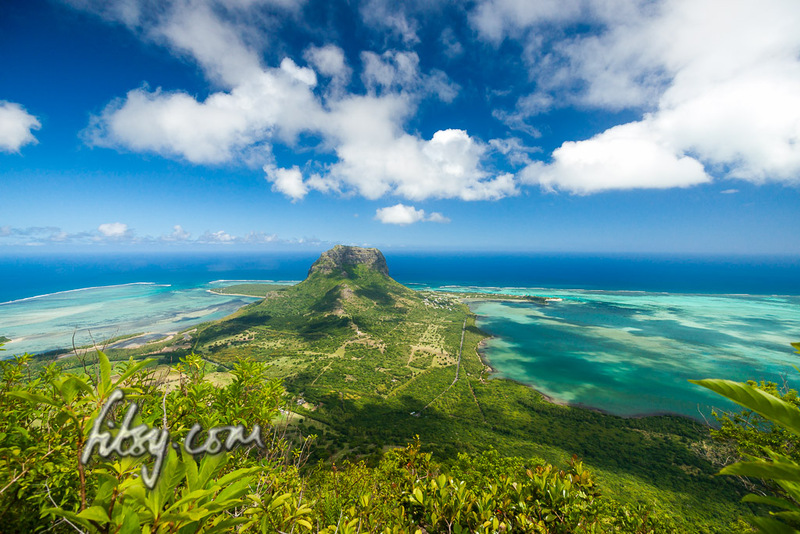 They are not particularly high, but offer nice views over the peninsula of Le Morne. Thanks to Sebastian for originally finding the route from Coteau Raffin village. This is a slight modification to his route as I didn't take the path on the outside of the fence which looked like too much effort. Many thanks to Sebastian for providing the description and gps track log for this hiking route which I followed recently. 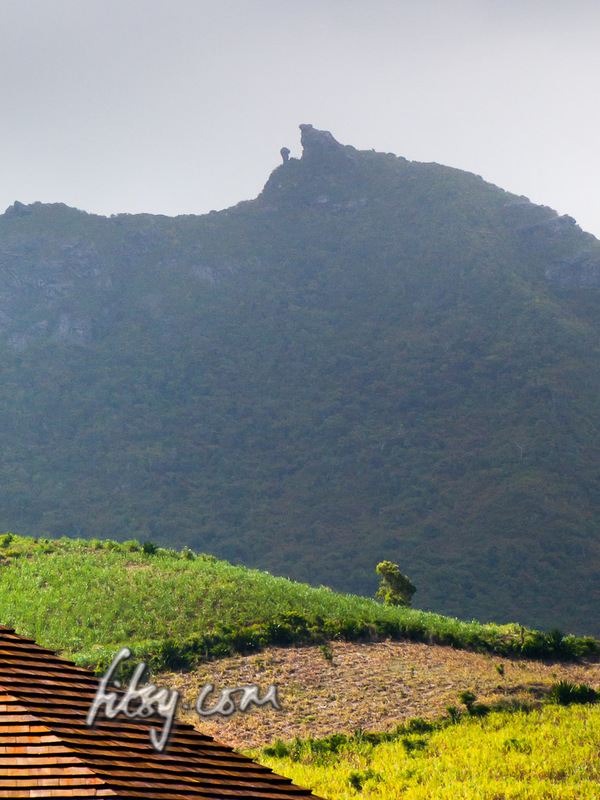 Deux Mamelles mountain is an isolated peak between the villages of St Pierre and Nouvelle Decouverte. As its name implies, the mountain consists of two peaks, both of which can be climbed relatively easily. Since there are no difficult parts, it is suitable for all ages. 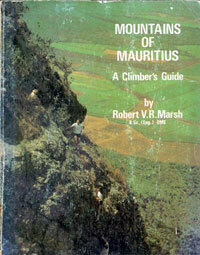 Deux Mamelles mountain is in the centre of the island, not too far from Pieter Both mountain in the district of Moka. Since this is a generally short hike, for the motivated hiker, it might be worth combining both the East and West peaks in the same outing or combining it with Mt Calebasses a little to the East near the village of Nouvelle Decouverte. This description covers the hike to the East Peak. On the map below, you will also find the track to the western peak which you can choose to follow. EDIT APR 2017: Pascal found a much simpler and safer way to the summit of Junction peak. Given that his route is much easier and accessible, I would recommend any potential hikers attempting Junction peak to take his route. The route described below is now obsolete. The Moka mountain range consists of four peaks starting with Mt Ory in the West, Junction peak, Berthelot peak and Guiby peak in the East. This mountain range is less frequented by hikers and with parts of the Northern slopes used for deer farming, and the southern side consisting of cliffs and thick woods, finding a path has been a challenge on each occasion. But with the right guided help, anything is possible! "The appearance of some [mountains] have, indeed, conjured up in the minds of some viewers a strange assortment of embroidered phrases and phantasies about their supposed origins and their imaginary sculptors. There are many, of course, which challenge man to climb and tempt him to rest awhile on their wind-swept summits." 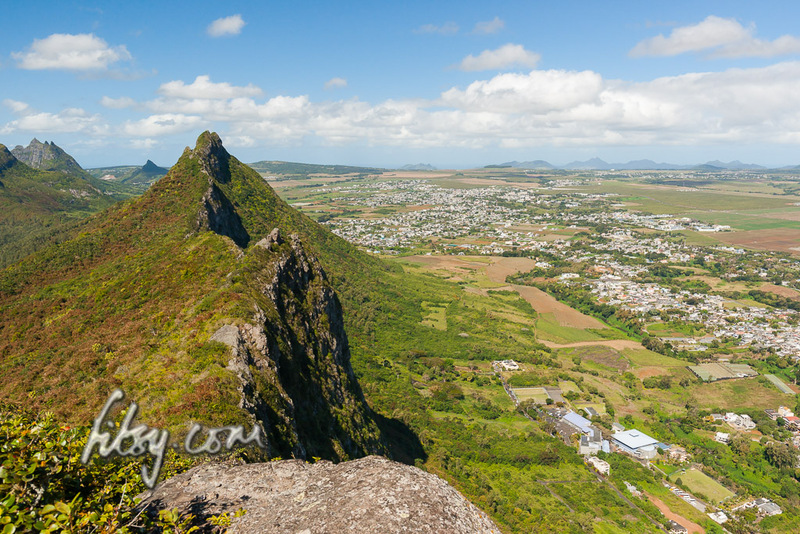 So, if you're heading to Mauritius or have been there previously, those little peaks dotted around the island have probably caught your attention. But knowing where to start, or even trying to find information can be a frustrating experience, but thanks to the modern day GPS - this is now a lot easier.